Pecora’s Air, Vapor, and Water Resistive Barrier consists of fully engineered and compatible products that work in tandem to provide complete air, vapor, and weather barrier protection for your building envelope. Our products can be used together as a system or independently as needed. The air barrier industry is one rife with innovation and a wide array of product offerings. Navigating through the vast number of products and technologies can be daunting to say the least. With well over a century of experience in developing products to protect the building envelope and expertise in material science and formulating, Pecora Corporation is well positioned to address the needs of the construction industry with regard to air barrier solutions. Our solution for an superior and versatile air barrier system is to provide a 100% fluid applied system offering that is both applicator friendly as well as high performing and is desirable to building owners, project engineers, and architectural specifiers. The current industry offerings consist of “wraps”, “peel and sticks”, “spray foams”, and “fluid applied” which results in a confusing array of possibilities. The table below provides the pros and cons of the various technologies. What is a “Building Wrap”? A wrap is a sheet material usually supplied in rolls which requires mechanical fastening of some type to hold the wrap to the wall sheathing surface. It is typically applied in a shingle configuration with approximately 2” to 4” overlap. The overlapping seams are sometimes sealed or taped but typically not. Mechanical fastening is required to attach the wrap to the wall sheathing with the obvious addition of multiple penetrations as well as labor. Wraps can be both permeable or non-permeable… but with seams and fastening penetrations present the non-permeable aspect would be negated unless all seams and penetrations are sealed completely. 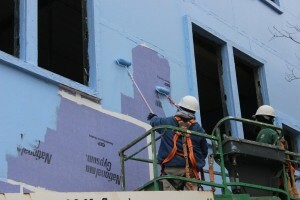 Building wraps are supplied in both moisture vapor permeable and moisture vapor non-permeable varieties. What is a “Peel and Stick”? A “peel and stick” is a sheet applied material supplied in rolls often composed of a rubber modified asphaltic “adhesive” membrane with a polyethylene laminated film to the exterior side and a release film on the underside which is removed as the material is “self-adhered” to the wall sheathing material. Self-adhering peel and sticks often come in various seasonal grades to allow for ease of application under various ambient temperature conditions. To obtain optimum adhesion a primer application is often required before the peel and stick is actually installed. Recent additions to the “peel and stick” industry offerings are composed of various “films” with a pressure sensitive adhesive usually of an acrylic variety that claim to have no need for primer. “Peel and Stick” materials are generally moisture vapor non-permeable with a minority of recently developed materials that are designed to achieve some level of moisture vapor permeability. What is a “Fluid Applied”? A “fluid applied” material is simply a coating that is designed to be either roll, trowel, or spray applied to a wall sheathing. Fluid applied air barrier materials are often supplied in various grades which are designed for either coating sheathing, sealing seams and joints, and flashing penetrations and window openings. “Fluid Applied” systems are fully adhered to whatever surface they are applied to with generally no need for priming or mechanical fastening. A correctly applied fluid system is monolithic with no seams or penetrations to be “post” sealed after application. Fluid applied systems are supplied in various chemistries with their own set of unique performance characteristics dependent on the chemistry and particular formulation. Fluid applied materials are very versatile in that they can be custom formulated to meet very specific needs. 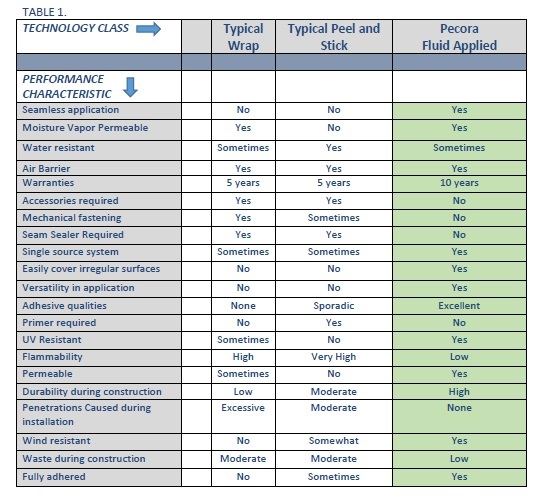 Table 1. below outlines some basic differences between the three main types of air barrier systems/material types. Table 2. illustrates differences within the various types of “Fluid Applied” systems.